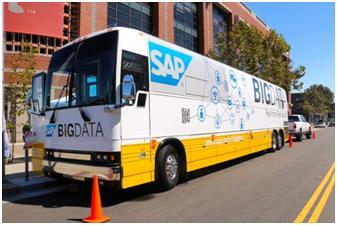 The SAP Big Data Bus: Are you on it or under it? The picture is now crystal clear for me around SAP’s Big Data strategy for existing/new clients and for eco-system partners announced a few weeks ago. SAP HANA is an incredible powerful solution to achieve real-time insight in order for your business to gain competitive advantages in various scenarios. The challenge I believe some have had…how HANA fits into a larger picture of a company’s structured and unstructured data strategy in and around their SAP deployments, which in some cases can amount to PBs of data. The concept of “Temperature of Data” comes up in more and more customer conversations we tend to have. Where do you deploy “Hot”, “Warm”, “Cold” data and how do you manage those data sources with the various technology solutions such as traditional RDMS, In-Memory solutions, and solutions for unstructured data. How do you also provide a foundation to build out the right infrastructure (on-premise, off-premise, or a combination of both) for all this data? The piece that I think becomes further clarified in this strategy is; how do you take it a step further and provide abilities and insights for how data can also move between each of the data sources based on policies driven by changing business climates. Vijay Vijayasankar did a great job outlining this future SAP Big Data direction including the SAP HANA Data Platform in an SCN blog post the other week. There is no question that Big Data represents a tremendous opportunity to gain competitive advantages for all kinds of organizations. Take for example, Americas Cup racing which is going on right now with the impressive AC72 Sailboats collecting massive amounts of data in real-time about conditions around them (winds, speeds, currents, and efficiencies) to improve accuracy and decision making to sail faster and more safely. If you havent checked out the Human Face of Big Data project, spend some time getting to know the stories about how Big Data is impacting and changing the world to be a better place. Incredibly inspiring stories about Big Data use cases in various cultures and geographies around the world. If you take the time to listen to the webcast recording you will learn how EMC has taken critical business processes that use to take 2 hrs (and sometimes not complete at all) down to 5 mins in order to get better insight and execute better decisions in Real-Time. So how does EMC fit into this SAP Big Data strategy? – First of all, many of us in EMC’s SAP practice feel it’s a very sound Big Data strategy hence we tend to have these conversations with clients supporting this strategy. – Secondly, when SAP clients embark upon a Big Data journey deploying SAP HANA, Sybase IQ, Hadoop, they will constantly look for ways to reduce the $ cost per/TB in each environment as well as in the overall data center architecture while maintaining the right SLA based on each business use case. Some of these deployments will be on-premise, some off-premise and some in a hybrid architecture…either way we believe EMC’s close integration with VMware (and being the parent company) will be absolutely key in this conversation as clients manage risk, cost and innovation. – Third, another area that we find ourselves in customer conversations is around Data Center Readiness for Big Data including SAP HANA deployments. Clients are looking for rock solid HA, Backup/Recovery as well as Disaster Tolerance solutions which are areas that EMC has 30+ years experience and has laid the foundation for most SAP clients in their existing architectures. 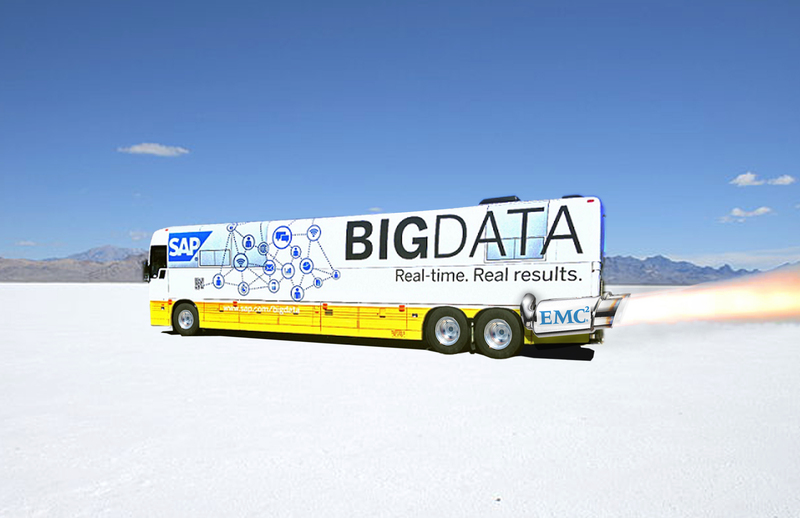 EMC Accelerates the SAP Big Data Bus! If you are interested to learn more on this topic, attend our next SAP Week event in SAP’s Houston EBC Nov 5th-7th.